I had high hopes they were going to get it right this time. I want to like these ABCs of Death movies. On paper, it's a great idea: an anthology film consisting of 26 short films from a number of important or up-and-coming voices in horror, each contributing a short film based on a single letter of the alphabet and resulting in some sort of horrible way to die. The budgets are low, the creative freedom limitless. As a fan of the anthology format, it seems like a can't-lose proposition. Yet here we are, now two movies in, and the formula still isn't working. 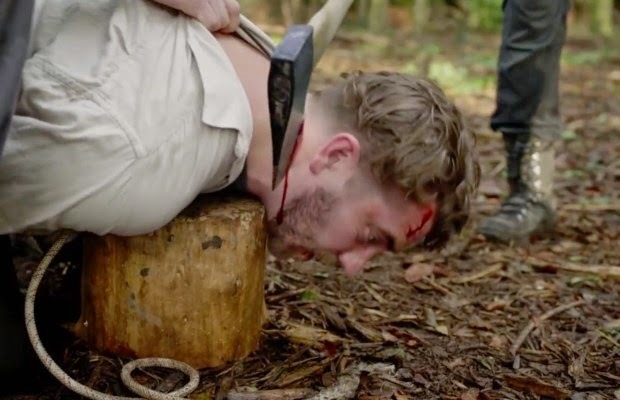 When I reviewed the original ABCs of Death last year, I expressed frustration at the inconsistency of the segments and the way that watching 26 like-minded shorts, all with the same end game in mind, led to a sense of sameness. The movie felt long and redundant, not varied and peppy. Now here's the sequel, offering 26 new shorts, 26 new ways of killing people off and 26 new filmmakers, making almost all of the same mistakes and disappointing me in almost the exact same ways. If there is a slight improvement in the overall quality, it is very slight. Its lows aren't as low, but its highs aren't very high, either. A lot of the movie can feel like a drag, as most of the best efforts are relegated to the last third of the film though the one that kicks it off, "A is for Amateur" from Cheap Thrills director E.L. Katz, is good. Otherwise, it's a bumpy road until past the halfway point; while a few might not be terrible, there are no clear standouts. Besides Katz, the filmmakers contributing shorts animator Bill Plympton, Steven Kostanski (of Astron 6), Vincenzo Natali, Larry Fessenden, Stage Fright director Jerome Sable and Jen and Sylvia Soska, aka the "Twisted Twins." They're two of only three female directors who get a short in the anthology (the third is Kristina Buozyte, who made Vanishing Waves in 2012); that's two more than the first film, which featured only one. For those keeping score, that's 52 short films over two movies, four of which are directed by women. Despite the gender disparity, it's a talented and eclectic group of filmmakers that have been chosen this time around -- a group I would expect to make a better film, if only because they had the opportunity to learn from the first movie's mistakes. Too bad ABCs of Death 2 doesn't bear that out. While there are a few bright spots, it's problematic in pretty much the exact same way. There is no growth in the sequel, only more sameness. It's the same issue plaguing the V/H/S films, another horror anthology series the collects cool indie horror filmmakers to disappointing effect. The segments presented here shouldn't feel as repetitive as they do, seeing as how many of the filmmakers take vastly different approaches. Some, like the Soska sisters, use their short to make a political statement. Some construct their contributions like O. Henry short stories, with a beginning, middle and end that usually twists on what has come before. Some experiment with the form, whether it's the trippy hand-drawn animation of Bill Plympton or the nightmare imagery of Robert Morgan's "D is for Deloused," which makes little sense but is hypnotic and creative and beautiful in its twisted way -- a crossroads of David Lynch, Henry Selick and Clive Barker. Jerome Sable's contribution, "V is for Vacation," is told entirely via webcam, while Juan Martinez Moreno (of Game of Werewolves fame) takes a literal approach to "S is for Split" and constructs a segment out of various split-screens. His is one of the best shorts in the movie, combining twisty storytelling with technical innovation. It's clear that he wanted to stand out from everyone else, and his efforts do not go unrewarded. Not all of the filmmakers are quite so ambitious. While there's nothing quite so lazy and uninspired as Ti West's "M is for Miscarriage" from the first movie (which, I guess, is a sign of progress? ), the majority of the submissions just lay there on screen, not strong enough to recommend nor crazy enough to be memorable. Even the weird ones (like Jim Hosking's "G is for Granddad" and Sôichi Umezawa's "Y is for Youth") just feel weird for their own sake, like they're playing at being twisted because they saw Timo Tjahjanto's entry in the first film. The worst among the shorts -- and again, there are none that are jaw-droppingly terrible (--Patrick Bromley, F This Movie!) -- fail to make any kind of impression. In an unrated horror movie with total creative freedom and almost an obligation to destroy the boundaries of good taste, that's the most unforgivable sin. It's not for lack of trying. What most of the contributions have in common is that they try to outdo one another in the fucked-up department. ABCs of Death 2 might be the sickest game of one-upsmanship ever committed to film. There are orifices violated by monstrous tentacles and graphic beheadings that require multiple swings of the axe. There are dismemberments and skulls cut open. The most frequent motif, though, is violence against children, as easy way to push buttons and seem transgressive without having to be particularly clever. Only "W is for Wish" really gets away with it, mostly by being one of the most inventive and darkly comic entries in the entire film, as well as one of my favorites. Most of the time, it's empty shock value. But then there is the letter "Z," the final short in the film directed by Chris Nash, a visual effects guy whose directing resume consists only of short films. Perhaps that experience serves him well, as he understands how to pace and pay off his segment in a way that hardly any of the other filmmakers do; whatever the case, his is the best contribution to the movie by a wide margin and almost -- almost -- worth waiting out the film's two-hour runtime. Every other filmmaker who wants to be shocking or transgressive in his or her entry gets taken to school by Nash, who presents us with images that are absurdly funny and beyond fucked up before hitting us with a punchline that is darker than dark. At least the movie ends on a high note. 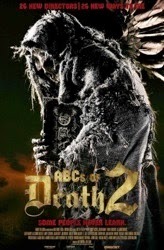 After two disappointing movies, I've got my doubts about the viability of this ABCs of Death series. And, yet, if there was a third movie I would watch it without hesitation. Maybe it's my endless optimism for the anthology format. Maybe it's my crippling inability to learn from my mistakes. I really do believe one of these movies could good -- or, at the very least, a lot of fun. It just hasn't happened yet. 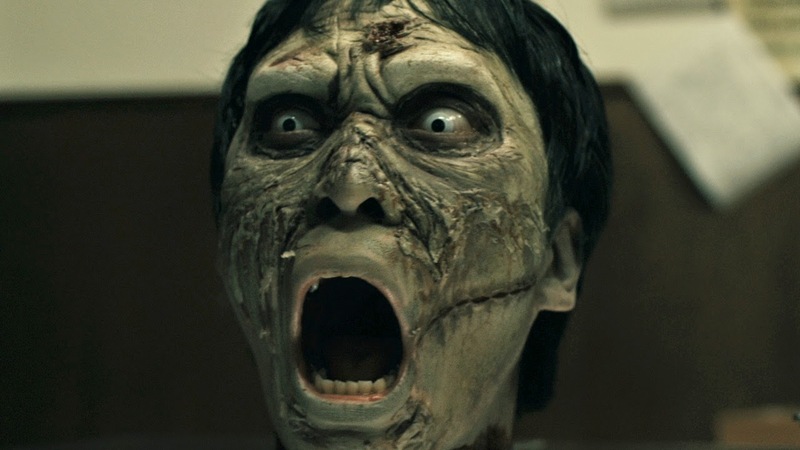 ABCs of Death 2 is currently available on VOD and iTunes before receiving a limited theatrical release on October 31. Curious about the one upsmanship discussion. Do any of the filmmakers have an idea of the other's entries or are they completely on their own not knowing what their 1/26th entry will mean to the entire product? I think they make their films in a bubble and have no idea what anyone else is doing. But they probably also push themselves in anticipation that they have to out-shock everyone else -- especially now that they've all (presumably) seen the first movie and have some idea of what to expect. I watched the first ABCs of Death and it wasn't a pleasant experience. Maybe I'll watch this one someday and just skip everything but A, S W and Z. Patrick did the hard work for me by watching all the crap in between. Thanks, Patrick! As someone who liked(I stress "liked") the first ABCs, I wish these movies worked more than they do. It might be that trying the feat of basically 26 short films in a row just isn't a successful experiment since most anthologies have a hard time with making three or four stories in a row work. I was very intrigued by the concept of these movies when I first heard about them but I never got around to watching the first one after reading abysmal reviews. It's a shame that they disappoint because maybe if they got together and came up with a game plan that made the movies feel more consistent they wouldn't feel like such messes. I will probably still watch them when I get a chance though. Thanks for the review Patrick. I'm with Travis. I also never got around to the first one. As JB says there are not enough hours in a day and I try to avoid stuff I know I probably wont like. And if you're a fan of other podcasts (Jordan, Jesse Go, in particular), Q is worth a watch. The credits are super lazy by the way, I've never seen a movie re-use the same music so many times in a row. I got it very quick and it was brand new still in the wrapping. Movie was a violent disturbing trip.